Fox Electricians is a team of experienced electricians providing a fast and reliable electrical and emergency repair service. 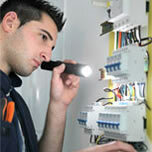 Fox Electricians is a team of experienced electricians providing a fast and reliable electrical and emergency service. We offer a diverse range of services in the areas of residential, commercial and industrial. Perhaps you need a smoke alarm installed, require a new television outlet or maybe your entire home needs re-wiring, our team of skilled, licensed electricians can do it all. We are proud of our famous 24 hour emergency service. We have helped countless home and business owners by carrying out emergency after hours repairs. We understand that you cannot wait until the next day to get the lights back on. call us at Fox Electricians. We have provided a reliable, fast and affordable electrical service to Sydney households for over a decade. 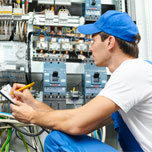 Our electricians are specially trained in emergency repairs. They are equipped with all the tools and knowledge to find and repair faults fast. We understand that sometimes you can’t wait until the next day to get the power back on. Are your power or data points in the wrong spot? Are your electrical items causing you problems? Are your smoke alarms working the way they should? Does your computing equipment have adequate surge protection? Have you seen the latest LED lighting options? Or perhaps you have considered a ceiling fan instead of an air-conditioning unit? Call us with your questions and we can provide you with answers and an obligation free quote. Fox Electricians has built a reputation for getting the job done right the first time, every time. Our experience means we can offer smarter solutions to your problems and needs. Is your equipment adequately protected from power surges? A power surge can wreak havoc on your computer networks and result in loss of data. Do you need additional data, power or phone points? Are you moving office or considering a new fit-out? Do you require new data cabling? Or perhaps you need to upgrade your existing cables for faster results? Need to optimise your electrical layout? Our team is ready to help you fix those annoying problems. Call us for an obligation free assessment. Fox Electricians is noted for exceptional service in the strata and property management sectors. We have looked after the repair and maintenance needs of many owners corporations and property managers for over a decade. Our team is highly skilled in the areas of emergency repairs, routine maintenance and electrical, lighting and data upgrades. Our team is always there to take your call and just as importantly, we are available 24/7. Australians love renovating. We can work closely with your builder, architect or designer and ensure the electrical and data component of your renovation is done right. After all, it is a lot more cost effective to get it right the first time. Our team understands that efficiency and reliability is important to the success of your project. We also appreciate that construction and renovation can be stressful. When you work with Fox Electricians we become part of your team and work hard to ensure things run smoothly. Whether it is a new dwelling or a renovation, our team provides a hassle free experience.